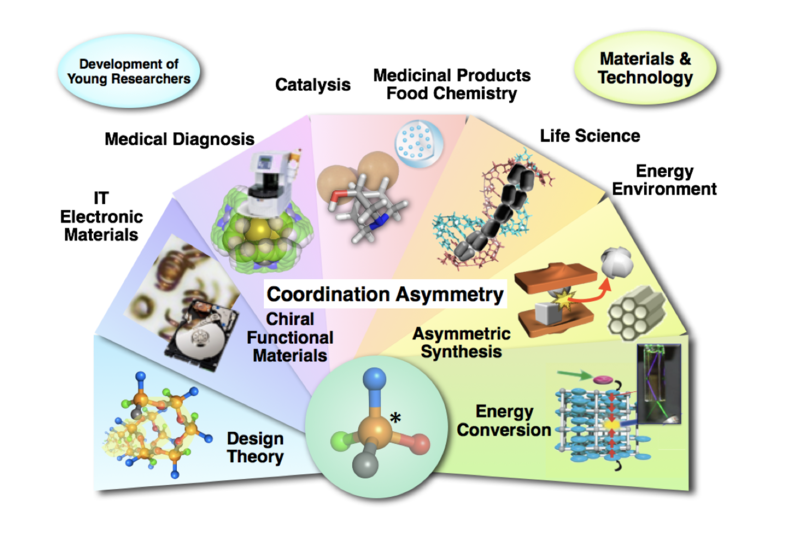 This project aims at developing constructive methods for asymmetric coordination spheres and anisotropically assembled structures of metal complexes by theory, experiment, and instrumentation, focusing on metal elements and their coordination spheres as platforms for steric control, reactions, and functional expression. According to this purpose, methods to create asymmetric and steric/electronic structures of metal complexes and their nano– to micron–size assembled structures will be developed by the molecule–based control of the coordination spheres to establish a scientific principle of “Coordination Asymmetry”. In particular, constructive methods for chiral metal complexes, including asymmetric induction of prochiral metal complexes, and asymmetric assembled structures are expected to develop new molecules and materials with anisotropic and directional structures and functions.